Rehearsals are now in their final week before next weekend's performances of Moliere's The Hypochondriac. The production is being done 'in the round', with the audience surrounding a small platform in the middle of the Big Schoolroom. Pictured are three of the main performers in rehearsal -David Cooper and Sebastian Stephenson on stage, with Celeste Guinness waiting. 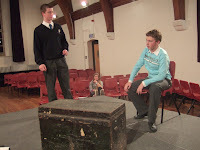 Rehearsals also continue for our entry to the St Andrew's one-act drama festival, Chekhov's A Marriage Proposal. This will be presented internally in the BSR on Tuesday 13th February, before it travels to Booterstown on the following evening.